Will there be a summer swoon, or a rocket rally? Markets are wound tight, despite a typical seasonal slowdown. It's the second week of August. There's not a lot of news, half the trading community is out, volumes are low, and stocks are moving in a narrow range. And yet, the markets can easily move very quickly. "I think we'll see a big move before Labor Day, but I'm uncertain which direction it will come," Miller Tabak's Matt Maley told me. That's typical of market sentiment right now: a feeling that the complacency could change very quickly. "There are a lot of bets across the table," UBS' Art Cashin told me Thursday morning. He's right, there are a lot of lopsided bets being made on stocks, bonds, and the dollar. What kind of bets? 1) All the major stock indices are at or near record highs. And yet there is considerable anxiety about a market pullback, led by technology. Just this morning, Morgan Stanley downgraded the semiconductor industry, saying the semiconductor cycle is showing signs of overheating. Maley has rotated into defensive names like health care: "If you're in those names, you'll have some downside protection, but should still be able to participate if the market breaks out further," he told me. 2) Volatility (VIX) is near the lows for the year, about as low as it can go. With the exception of a good part of 2017, the VIX has rarely remained near 10 for very long. Hedge funds appear to have taken exposures down into the less liquid August period. The VIX curve has steepened: short-term volatility has dropped considerably, call buying has increased. 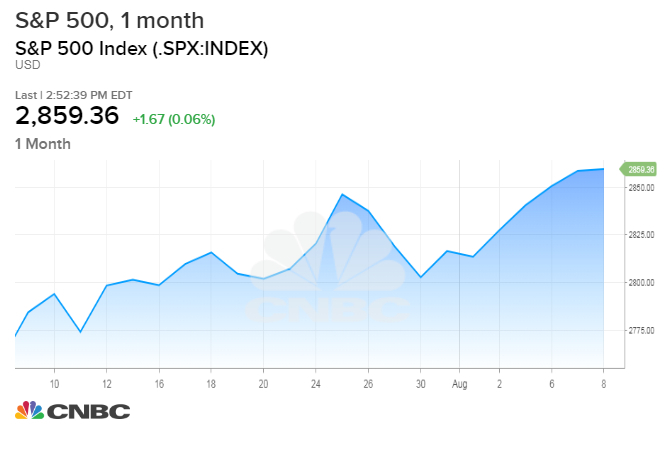 "Trump is on vacation, but with the VIX this low, the hedge funds seem happy to take the summer off," Peter Tchir, Macro Strategist at Academy Securities, told me. "The 'sell volatility' strategy seems very overcrowded to me, and I have been encouraging clients to bet against it." He expects a plus or minus five percent move in the S&P 500 by mid-September. 3) Traders are continuing to heavily short Treasuries, betting that rates will be rising as the Federal Reserve continues to push up short-term rates. Yet buyers of long-term Treasuries have been unusually persistent, contributing to a flattening of the yield curve. 4) Inflation numbers have remained relatively tame, but it took very little to get the markets very worried earlier in the year. Jim Paulsen at Leuthold Group noted that "it was inflation/overheat/Fed which began this correction in January and the bad wage number which worsened it in February. Since, we have not had any more bad wage numbers. However, aren't we just another one-off "Bad" Payroll Friday from being back again in February?" "It's been impressive the market is holding up so well with the dollar grinding higher," Alec Young, Managing Director for Global Markets Research at FTSE Russell, told me. 6) Traders have continued to express surprise that the growing China trade war has made such a small impact on our markets. "China's markets have bared a significant burden while our markets continue to ignore it and climb higher," Michael O'Rourke from Jones Trading told me. "If [China President] Xi decided to aggressively ramp up his rhetoric in the next few weeks prior to the comment period ending (9/6) for our next $200 Billion in tariffs it could create volatility in a thin tape," he said. Bottom line: There's a lot of lopsided positioning out there, and some very small action can significantly move the markets, as Art Cashin keeps reminding me: "As we learned from Mr. Musk, it doesn't take too much to suddenly get the market's attention on something, so any one of those things - if you began to see a change in yield, in rate structure, it could sweep across the market, so I'm crossing my fingers and saying, let's take another try at getting to the highs," he said.